Hello again! Well, I made it back from Denver in one piece. One exhausted, pajama clad, no makeup piece, but still, Craftsy was SO much fun. I'm not sure if the course has an official release date yet, but I will definitely keep you posted. Anyway, this morning I needed to look something up and knew it was on my blog. Problem was, I couldn't find it. So I decided to do a little housekeeping. See those new buttons over there up toward the top on the left hand side? Those are new! 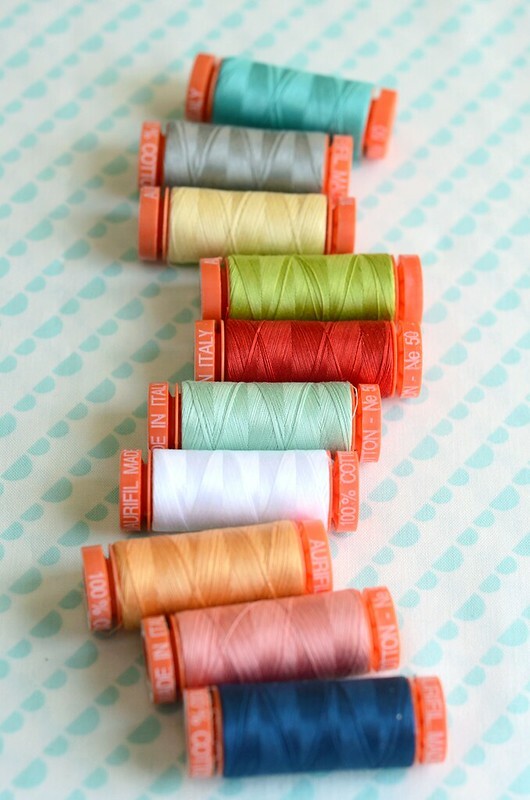 I put together an About Me page, a page dedicated to house links, paint colors and such, and one that I think you'll be most excited about (I hope), a link to my favorite quilting/sewing supplies. I am always so curious to see what other people use in their sewing rooms, so I compiled a list there of what I use every day. Hopefully it will be helpful. So what's next? 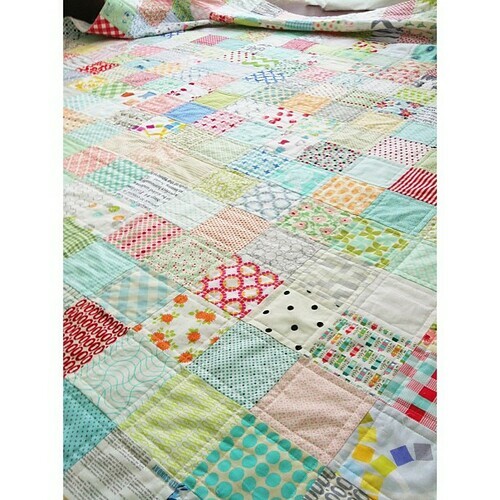 Compiling the page of all of my quilts and projects. I haven't quite figured out the best way to do that yet, but I'm working on a few ideas. Watch for more blog sprucing coming soon! Anything I'm forgetting? One afternoon a few years ago I ran out of thread. Usually I buy a lot at a time so this doesn't happen in the middle of the night, but this time I just happened to completely run out. 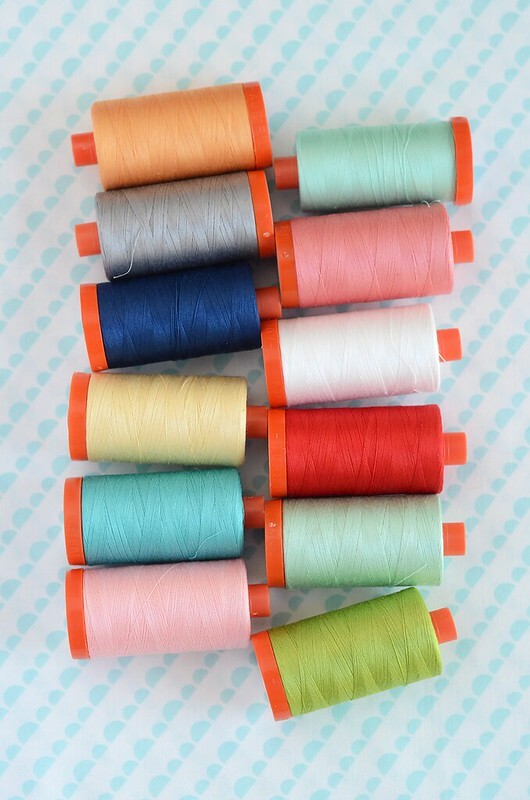 I hurried over to my closest local quilt shop before they closed and since they didn't have the kind I usually bought, I bought my first spool of Aurifil white thread and headed home. 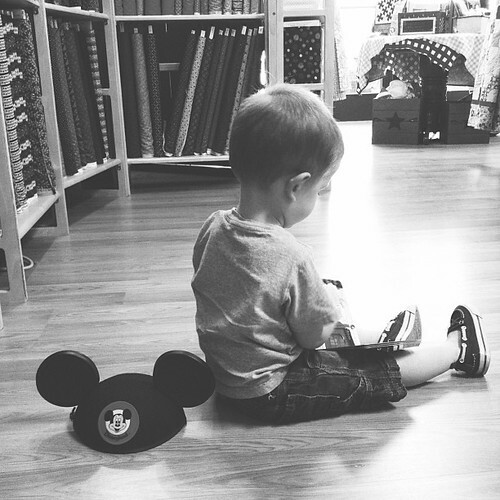 It was love at first stitch. And I never went back. Just ask my friends that come over to sew. 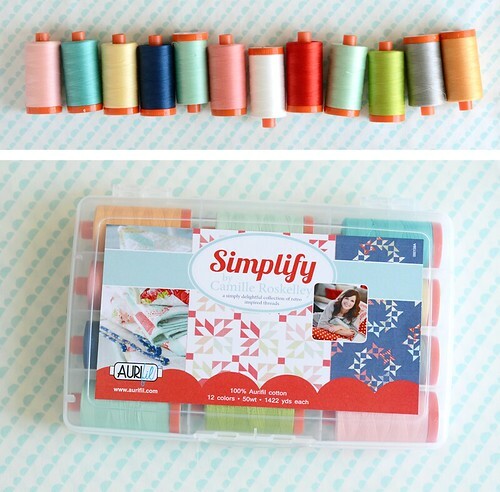 They've all converted too, and love Aurifil as much as I do. Or, you know, almost as much. 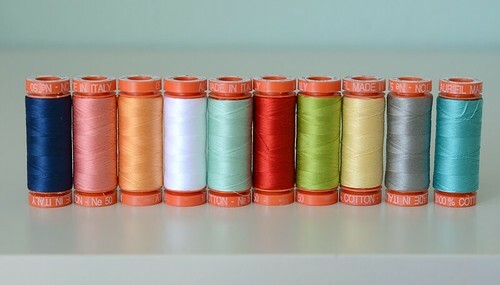 ;-) I really love thread. Last Quilt Market I met up with Alex Veronelli from Aurifil and discussed putting together a collection of my favorite threads. And I am so, SO excited to show it to you! 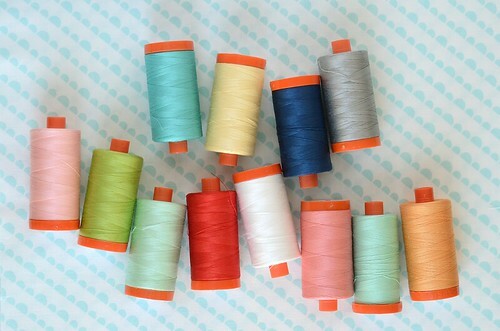 Red, light aqua, lime, teal, orange, yellow, medium aqua, gray, coral, pink, navy, and my favorite white. All my favorite colors in one box. And yes, this would go perfectly with all of our collections from Bliss to Scrumptious. Not to mention all those scrappy projects I've been making lately. I love these colors, can you tell? and a larger box with all 12 colors in 1422 yd spools. They are all 50 wt (the weight I use for piecing, quilting, applique and binding) and 100% cotton. 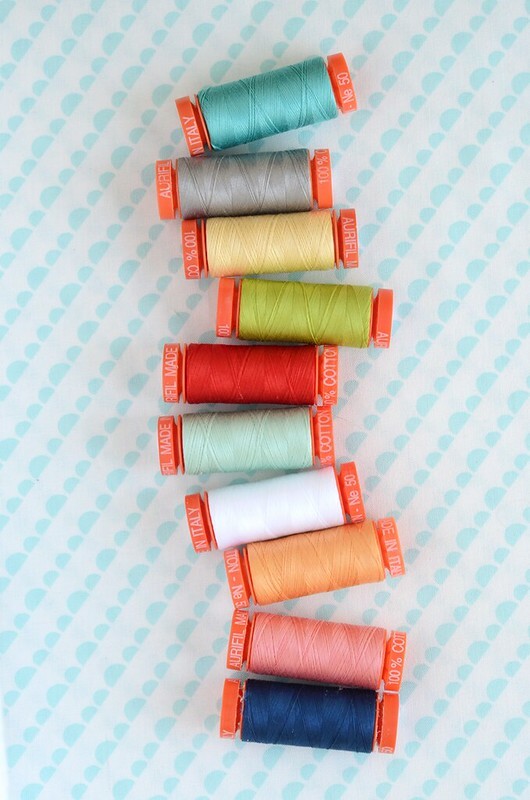 Aurifil is made in Italy and it's dreamy to sew with. Trust me. Well, it's official. I'm all packed up and ready to head to Denver to film my next Craftsy class. and the quilts have been carefully stacked in suitcases. And this came just in time. More on that (and better photos) when I get back. Did I mention I'm really nervous? Yeah, that too. Hello again! I know it's been quiet over here, but instead of complaining about the heat (which I could have, it was a whopping 117 degrees last week), I've been enjoying staying in and sewing up a storm. I finally got back to my low(ish) volume quilt and got it quilted. Just trying to figure out what to bind it in. Speaking of bindings, my scrappy binding rolls are getting pretty big! I'm loving this Piece of Cake 2 quilt out of Scrumptious that Sherri pieced last minute for a class I'm working on (more on that in a minute). A lovely sight at the Christmas Goose Quilt Shop when I went to drop off a quilt for Andrea. This one was so patient. He even brought along a book to read. 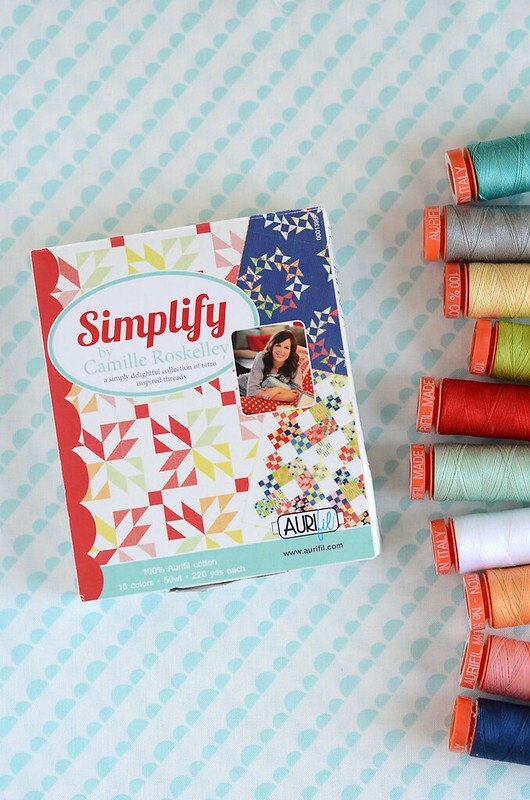 Can't wait to dig into this lovely stack from Kerri at SewDeerlyLoved! 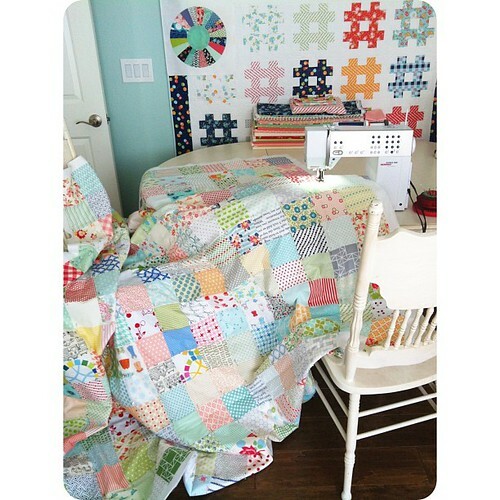 And last but not least, a scrappy dresden quilt that has been so much fun to work on. I'm happy to say you'll be seeing more of this one in my new Craftsy class. And soon!! I've had so much fun getting to know all of you in my first class (on sale for 25% off right now, by the way) and can't wait to film another one in a few weeks. Now back to work! What are you working on?